NOWNESS premieres new video for Sabanoh! Watch on NOWNESS. Shot by Wills Glasspiegel, riddim by Lanzo On D Beat. Get your tickets and find out more here. The new album BUILD MUSIC comes out on Luaka Bop this March 24! Read more about BUILD MUSIC over at Luaka Bop. Read Janka's intimate conversation with Bandcamp Daily here. Check out the track and read more about the project on Fader. Janka Nabay & The Bubu Gang are set to kick off the "Dounoya: Global Sounds on the Hill" series on Sunday, March 15. Read more about the series here and purchase tickets here! Janka Nabay stopped by WYPR in Baltimore to share his story and his music. Listen below to learn more about Janka's musical influences and the spiritual beginnings of Bubu music. 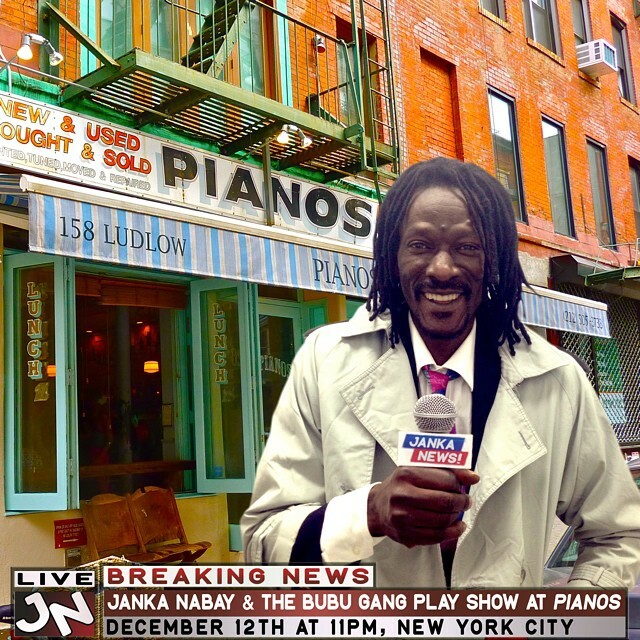 Janka Nabay & The Bubu Gang play Pianos! Breaking News from Janka News!!! 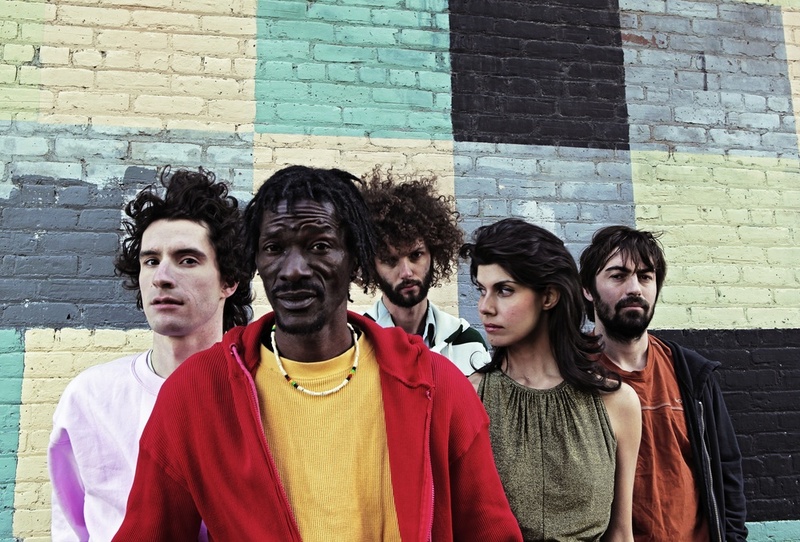 Janka Nabay & The Bubu Gang return to NYC for a show at PIANOS, December 12 @ 10pm. Click here for tickets! Janka Nabay & Sleepy Doug Shaw perform S.E. Rogie's "My Lovely Elisabeth"
Watch Janka Nabay & Sleepy Doug Shaw perform a Sierra Leonean classic on the back of a Chrysler LeBaron convertible as part of Luaka Bop's 25th anniversary celebrations. Janka Nabay to perform at Luaka Bop's 25th anniversary! Luaka Bop will be celebrating its 25th anniversary this week with a series of performances and talks at Mmuseumm, a kind of natural history museum located in an abandoned freight elevator, accessible through an alleyway in TriBeCa. Janka Nabay is set to perform three of his latest or oldest songs (don't know which) alongside guitarist Sleepy Doug Shaw. Click here for the full schedule of events and read more on Pitchfork, here. Janka Nabay opening for Os Mutantes at Celebrate Brooklyn! Janka Nabay & The Bubu Gang will be performing with Os Mutantes, the legendary Brazilian psychedelic-tropicalia band re-discovered by Luaka Bop (and who Beck later named an album after), and Javelin at Celebrate Brooklyn! this summer. Click here for more information. Check out the new video for "Feba"! The new video for "Feba", directed by Jon Casey, premiered on Stereogum today. Watch below! Janka Nabay makes NPR & Washington Post's "Best of 2012"
Janka Nabay & The Bubu Gang's debut album, En Yay Sah was included in Washington Post's Best of pop culture 2012 and NPR's 50 Favorite Albums of 2012. Hooray! 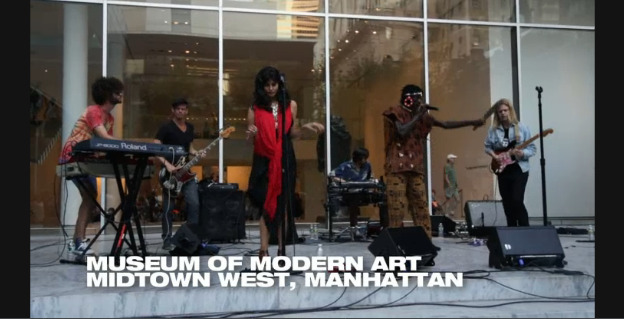 NBC spoke with Janka Nabay & The Bubu Gang after their performance at MoMA's "MoMA Nights" series. Watch here! Janka Nabay with Omar Souleyman! Janka and The Bubu Gang were asked to play at WNYC's studio. Listen below! Janka performs tonight at MoMA! Janka Nabay & The Bubu Gang will perform at MoMA as part of the "MoMA Nights" series, curated by Olivier Conan of Barbes. More info here. Janka discusses his song, "Nar London," a tribute to Sierra Leonean long-jumper Ola Sesay, with Vanity Fair. Read the full interview here. Janka makes track for 2012 Olympics! Janka teamed up with fellow Sierra Leonean, Bajah, for "Nar London," a song dedicated to Ola Sesay, the Sierra Leonean long-jumper who will be competing in this summer's Olympic Games in London. Watch the video, which premiered on okayplayer today, below! Janka & Delicate Steve at Rubber Tracks! After a series of gigs together, Janka and the Bubu Gang got together with Steve Marion and members of his band, Delicate Steve, at the Rubber Tracks studio in Brooklyn. Below is a clip recorded in the control room of the studio while the guys worked out a tune called "Photographer."